The sequel opened with a flashback (and Frodo's dream) of the scene in the first film when Gandalf battled the fiery Balrog at the Bridge of Khazad-dum and fell into the chasm, as they continued to fight each other. 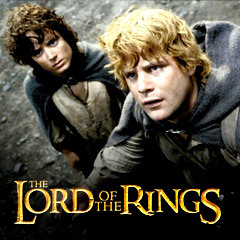 The film picked up the story of Frodo and loyal companion Sam on their way to Mordor, lost on the treacherous rocky mountain path of Emyn Muil. They were pursued on their arduous trek by the cave creature Gollum (physically and mentally deformed and corrupted - obsessed with repossessing the Ring for himself), thinking that they were thieves who had stolen his "My precious". Pitying him, Frodo decided to trust Gollum/Smeagol, to act as his Master, and have him be their guide on the way to the Black Gate of Mordor. In a second storyline, abducted hobbits Merry and Pippin were held by an army of Saruman's Uruk-hai/Orcs and taken to Isengard, while being tracked by three of the original Fellowship: exiled Gondor heir Aragorn, dwarf Gimli and keen archer Legolas. The evil wizard Saruman was allied with Lord Sauron to dominate Middle-Earth ("The world is changing. Who now has the strength to stand against the armies of Isengard and Mordor? To stand against the might of Sauron and Saruman and the union of the two towers?"). Saruman sent his army out to burn peasant villages, beginning in the region of Rohan ruled by horse-lords and King Theoden (Bernard Hill). The King's only son and heir Theodred was lethally wounded by ambushing Orcs, and the King's nephew Eomer (Karl Urban) was distressed by the killings and wanted to defend the kingdom of Rohan. Eomer was opposed to the King's treacherous assistant Grima Wormtongue (Brad Dourif), who was in league with Saruman and had lustful feelings for the King's pretty niece Eowyn (Miranda Otto). Grima banished Eomer from Rohan, and continued to weaken and sicken the King with his powers. Eomer's Rohan riders massacred the Orcs and Uruk-hai holding the Hobbits, but unbeknownst to Aragorn, the two had escaped into the ancient Fangorn Forest, where they were saved and befriended by a sentient walking-talking tree creature (or Ent) named Treebeard (voice of John Rhys-Davies) that held them safely in its branches. Meanwhile, Frodo, Sam, and Gollum traversed through a swampy Dead Marsh and evaded a Nazgul Black Rider-Ringwraith on a flying beast before arriving in front of the heavily-garrisoned Black Gate at Mordor. At the Mordor Gate, Gollum divulged another secret pathway (with stairs and a tunnel) for entry, although Sam suspected a trap. Wizard Gandalf reappeared to the warrior group in the forest as a reborn Gandalf the White ("I've been sent back until my task is done"), and together they rode to Edoras in Rohan. At Rohan, possessed King Theoden was reinstated (after Gandalf released him from the spell of Saruman - fully healed and restored) and then banished Grima. To avoid risking "open war" with Saruman's forces, King Theoden decided to take his people for refuge to their fortress at Helm's Deep. Gandalf left to find Eomer and his 2,000 Rohirrim force who were 300 leagues away, and promised to return within 5 days. Meanwhile, Grima reported to Saruman about Rohan's plans - solidifying Saruman's determination to destroy them. Armies were gathering to fight "the last war that will cover all the world in Shadow". During a skirmish, Frodo and Sam were taken captive by soldiers of Gondor as Gollum/Smeagol escaped. During the retreat to Helm's Deep, Aragorn was feared dead (he tumbled off a cliff into a river far below) when the contingent was attacked by Saruman's beastly Wargs ridden by Orc soldiers. Saruman sent his vast ten-thousands of troops (composed of monster warriors called Uruk-hai - Orcs cross-bred with Men) from Isengard to attack the small overwhelmed army of 300 at Helm's Deep and destroy the world of Men. Aragorn was not dead, however - on the water's edge, he was nudged by his horse, revived, and was able to ride to Helm's Deep to lead the defense. Back in Rivendell, Elrond convinced his immortal elf daughter Arwen to retreat from their threatened area on a ship bound for Valinor and give up her love for Aragorn (to convince her, he provided her with a vision of his eventual death and the pain it would cause her). Sam and Frodo were taken to Boromir's younger brother Faramir (David Wenham), a captain in the Ithelien Rangers in the land of Gondor - "the last free kingdom of Men" that was threatened by Sauron. Faramir also captured Gollum, using his Master Frodo to entrap him, and then learned of the Ring. He also succumbed to its temptation: "The Ring of Power within my grasp...The Ring will go to Gondor". A gathering of the trees, called Entmoot, was held to decide if the Ents would assist in the war against Saruman's forces (they at first decided not to get involved - "This is not our war") - although an enraged Ent persuaded the other trees to assemble and ultimately march. It was dubbed "The Last March of the Ents" - against the treacherous Saruman because he had decimated the forest by industrializing Isengard. Defensive preparations were made at Helm's Deep, and although the situation looked dire and impossible, a battalion of Elf reinforcements arrived from Rivendell, led by Haldir (Craig Parker). After an initial attack in the pouring rain, the walls of Helm's Deep were scaled with ladders and then destroyed with explosives in the area of the sewer drain opening. Elf leader Haldir lost his life, just as the defenders were forced to retreat into the rear Keep. One last horseback attack into the midst of the enemy was led by Aragorn (to allow the women and children to escape on a mountain pass), bolstered by the arrival of Gandalf (on his white horse) and Eomer (and his cavalry warriors) who then triumphed over Saruman's Uruk-hai/Orc troops, while the marching Ents destroyed Saruman's stronghold at Isengard (throwing boulders and causing a dam burst and flood to topple the tower of Orthanc). At the same time in the ruined Rohan city of Osgiliath (the former capital of Gondor), Frodo narrowly avoided giving up the ring to a Nazgul Ringwraith riding on a winged creature because of Sam's intervention, and Faramir was finally convinced to release Frodo to continue his journey to Mordor with Sam (now Samwise the Brave) and a scheming, dark-natured Gollum. The next chapter would show Sauron's terrible wrath and swift retribution: "The Battle for Middle-Earth is about to begin." With most of the same characters from the original film, and a few new ones (pictured here). Although it was the middle film of the original trilogy, it received the most critical praise from reviewers (especially Andy Serkis' motion-capture performance as Gollum), even though it was three hours in length. Nominated for six Academy Awards (with two Oscar wins): Best Visual Effects and Best Sound Editing. Nominations for Best Art Direction, Best Film Editing, Best Picture, and Best Sound. With a production budget of $94 million, and box-office gross receipts of $342.6 million (domestic) and $926 million (worldwide). It was the second-highest grossing (domestic) film, and the 5th lowest-grossing (worldwide) film of the entire 6-film franchise. Set-pieces: Gandalf's fight against Balrog during their free-fall, Gollum's schizophrenic talk with himself (as Smeagol), the Orc/Warg (giant wolves) attack upon the Rohan exiles fleeing to Helm's Deep, and the climactic battle at Helm's Deep.